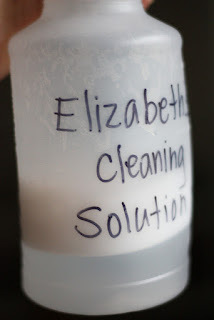 I must admit, Elizabeth is MUCH more excited about spring cleaning than I am!! Last week, she wanted to clean windows SOOO badly, but I don't like her using Windex because I don't want her inhaling the fumes nor do I want to take the chance of her ingesting any of it. I promised her a trip to Walmart so that she could pick out her very own cleaning bottle. WOOHOOO the girl was ECSTATIC and here she is cleaning away!!!! Here's a closeup of her prized cleaning bottle. She was even more excited when we mixed a special concoction for her to use to clean- fill it up with water, add 1/2 tsp baking soda and a drop of dishwashing liquid. The girl is ready to clean the world, I do believe!!! And this is how much of her special "cleaning solution" she had left after only a FEW hours "cleaning"!! HA!! She was REALLY into cleaning, wouldn't you say? So have YOU started your spring cleaning yet? Are your children helping?? I had to smile when I saw the picture. Give Megan a spray bottle and a cloth and she goes crazy! I haven't started my spring cleaning, but I really need to. That is one of the first things I thought of when I woke up this morning. Scary, I know!! I love the "helping" age. My four year-old actually asks for chores when her older siblings are doing theirs. What a great idea - my 4 year old son has been asking me to let him help spray and I always have to tell him no. I'm going to follow suit and get him his own bottle today! I am positive he will LOOOOOOOVE his new cleaning bottle!! 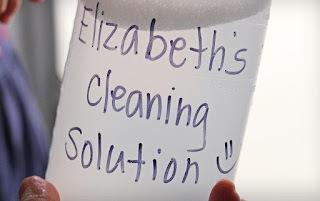 I'm wondering if Elizabeth will still feel the same way about cleaning in 10 years as she does now? HAHA!! Are you available on the weekends? Looks like I could learn a thing or two from you :). That's a great idea! My son wants to help so much, but like you, I worry about the cleaners. I'm going to do this for him. I think he'll be thrilled. Too funny! Sarah does the same thing with her very own spray bottle. She loves to clean our bathtub - for some strange reason. Maybe I should get her started on the windows. How cute! I remember when our son enjoyed helping around the house. I'm about to move, so it's organizing to pack instead of spring cleaning. As it is about every other year! I shall have to bookmark your site and find you often again, because my "Bluebonnet" is just the same age as your Elizabeth. This is too good. She looks so happy. my girls LOVE to help clean - especially since i have given them their own brooms, dust cloths, spray bottles. the other night, they offered to mop the kitchen floor for me, and proceeded to get their own bucket of water, add soap and a little lemon oil, grab rags from under the sink, and scrub the floor on hands and knees, singing "just whistle while you work" together, and giggling a bunch. i wish i had taped it. She just gets more and more beautiful! 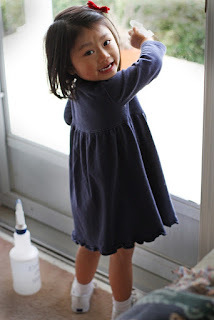 My youngest is 9 now, but she still likes to clean the windows and glass doors! Let's hope they never grow out of it! A special one year anniversary GIVEAWAY!!! Do you use a dish drain?